Instead of presenting the usual NC Challenge that has accompanied the Daily Dare, in past years, Lulu has put down her game controller to help save Roo Island from a massive bug infestation related to the activation of a new Games Room machine, created by King Roo. 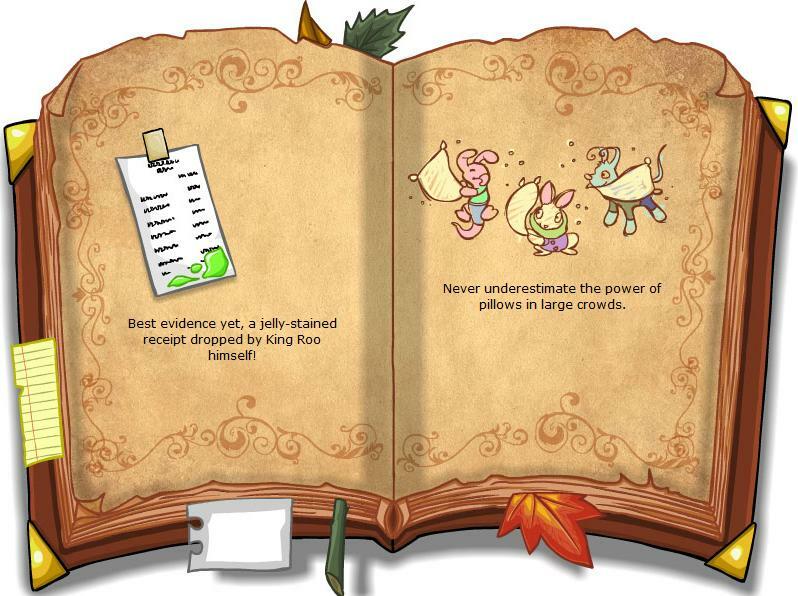 In the course of Lulu's quest, TNT released two NC events for the Daily Dare 2012 - The Case of the Missing King and Lulu's Bug Hunt. Players may choose to participate in either, both, or neither event. Participating in the NC events does not affect your trophy for the Daily Dare. bugs in King Roo's machine were causing mild mayhem in the Game Room. She wanted to keep a close eye on her brother. 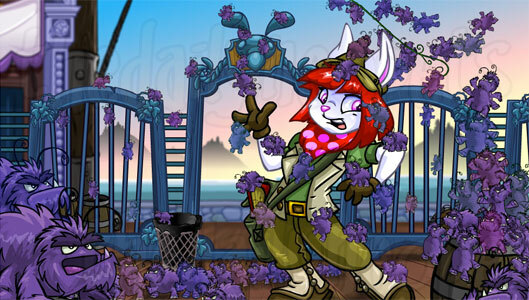 Instead of hanging around to challenge Neopians at games the Avinroo siblings' cousin, Lulu, volunteered to go in search of the missing King Roo. 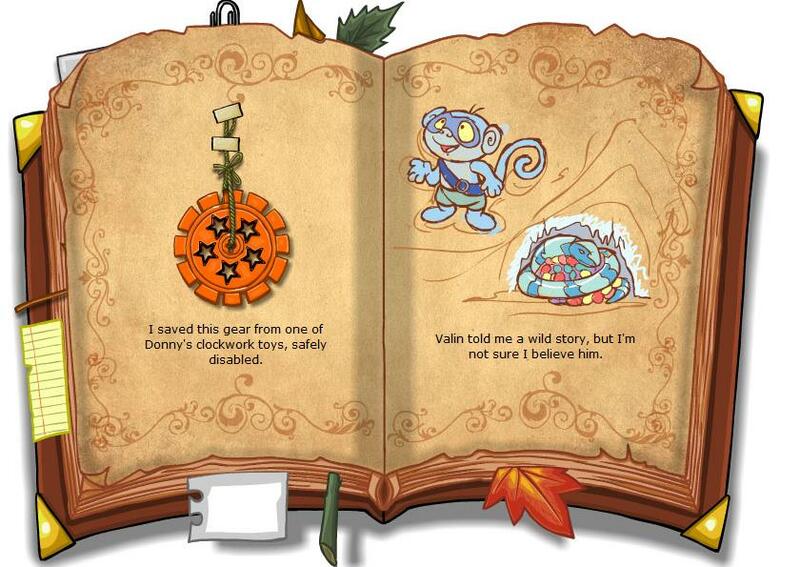 Gathering up her adventuring book and some other supplies, Lulu set off on The Case of the Missing King NC Adventure! The Case of the Missing King is a 13-day event, running from March 9 to March 21. The Case of the Missing King Adventure Book Page Packs can be purchased as 5-packs or 13-packs. 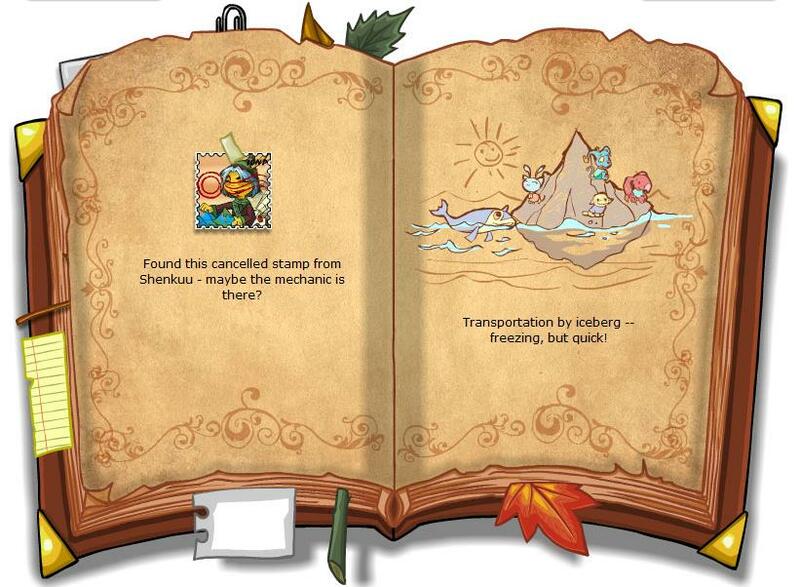 Adventure Book Page Packs must be activated in your inventory before you can use them to vote. 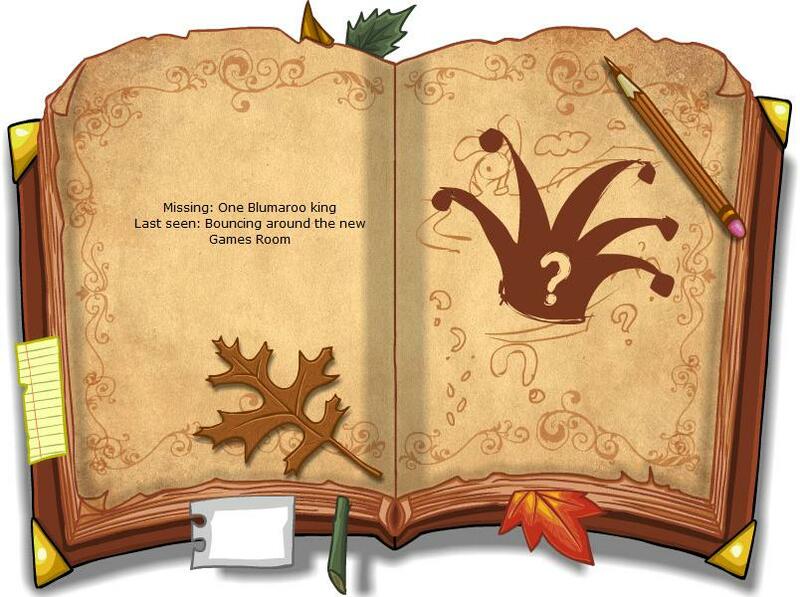 Once activated, players can choose to use one of their book pages to vote on Lulu's next step in completing her quest to find the missing king. Lulu will take the path chosen by the majority of the voters. Everyone who voted on a given day will receive the prize for that day. Prizes are awarded the day after votes are cast, so that all participants have the full day to vote. So AAA's running the Games Room in King Roo's absence, which sounds hilarious. 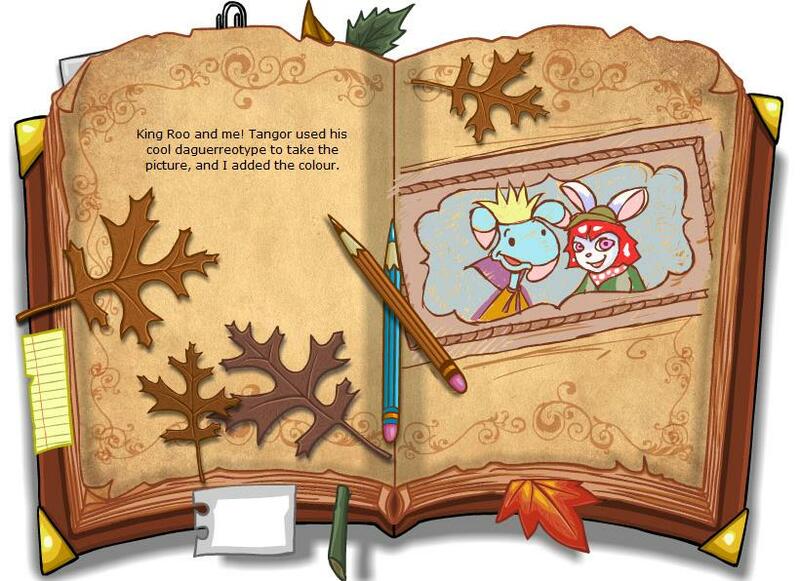 But Abigail asked me to help her by finding King Roo, so I decided to use my journal to record the search, like a proper detective. Game scores aren't really my thing anyway, and how hard can it be to find one Blumaroo? Find out what Advisor Broo knows about the missing king. Sneak into the Roo Island throne room and look for clues. Those Rooish royal guards are totally unobservant. 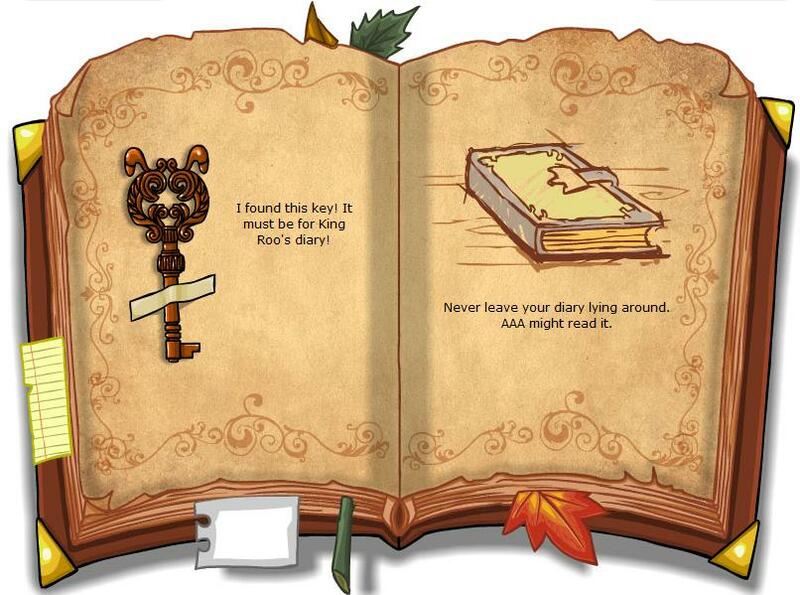 I just sneaked into the throne room, found what appears to be King Roo's diary key, and sneaked out without them noticing. Just as well. From what I hear, if you're caught breaking the law, you have to play bingo. The risks I take for my cousins! Ugh! There's another one! What's with these strange bugs I keep finding? If this is AAA's fault, I'm totally giving away his game controller when he's not looking. 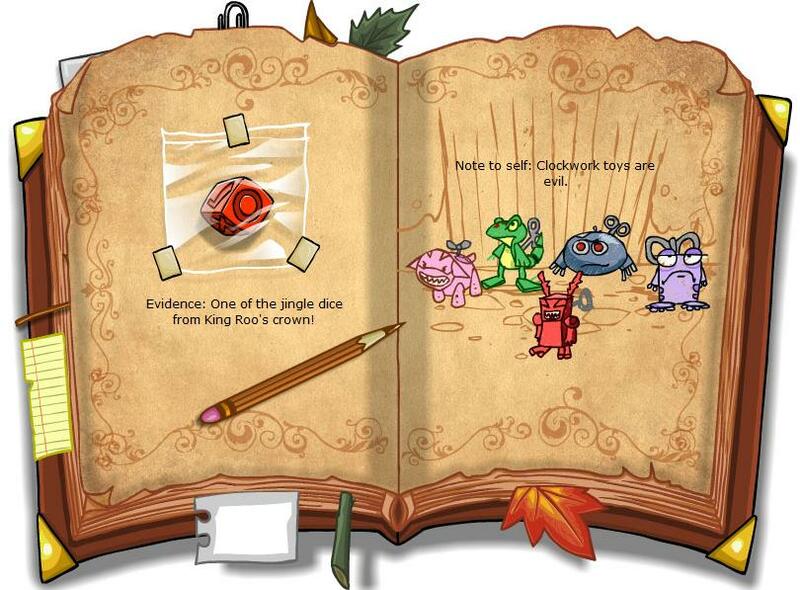 Sneak in and page through Dr. Clodbottle's notes. Are we sure Dr. Clodbottle isn't a mad scientist? Some of his notes were a little... worrying. But the good news is King Roo WAS here and did consult with the doctor. Apparently, King Roo showed him one of the Games Room bugs. Dr. Clodbottle didn't recognize it, but he still refused to help King Roo do any harm to what he called "potential recruits for the Habitarium". Ask Dr. Clodbottle's assistant about King Roo's visit. So Dr. Clodbottle was no help. And King Roo is long gone again. Argh! I guess the bugs aren't any known kind of Petpetpet, after all. Dr. Clodbottle didn't recognise them, and he's an expert. If King Roo can't solve the bug end of the problem, what's his next move? I'm thinking that maybe he'll try to fix the Games Room not to attract pests. I'd better track him down soon. Stop by the Food Shop for a bite to eat. Inquire about King Roo at the Bookshop. Never visit the Magical Bookshop during rush hour. You'll just be run over by restockers. When I finally could talk to the shopkeeper, he told me that King Roo bought a repair manual a few days ago. I gather that King Roo tried to just read it in the store, but the shopkeeper yelled at him, and even then our good king left a Jelly Dice snack bag on the floor. The bookseller is pretty annoyed. So King Roo has a repair manual now. I don't know that the new Games Room machine is really going to be listed in a repair manual anyone can buy at the Bookshop, though. Hmm. I'm going to ask where King Roo went next. But first, what's that noise outside? Wow, it's a bunch of Neopets holding a pillow fight. Feathers are flying everywhere! Oh no, the're coming this way! Flee from the attacking pillow mob; there are too many! Grab a pillow from a clueless bystander and join in the fun! Aw, yeah. Pillow fight in Neopia Central, Year 14. This one's going down in the history books. Ahem. I grabbed a pillow and there was epic fun, until some Alien Aishas caught me whacking the Vending Machine... I mean, patting it gently. How much harm can a pillow do, I ask you? But what I saw behind the Aishas made me drop my pillow. One of King Roo's Jelly Dice snack bags, burnt around the edges. The work of ray guns, no doubt! This is bad. I've been mulling the facts, and there's only one logical conclusion. King Roo must have been kidnapped by Alien Aishas! He could be in outer space even as I write this! I'm thinking this was not part of his plan. Demand to know King Roo's whereabouts. Sneak into the Alien Aishas' teleporter. I'm in SPACE! The teleporter put me on the Alien Aisha mother ship. I wasn't expecting that. Anyway, a janitor spotted me peeking into storage rooms. He told me King Roo was caught snooping around the Vending Machine, so they interrogated him. Yikes! Then the janitor gave me a brochure in case I want to come back and visit. The Splurgles are supposedly delicious. I'll take his word for it. 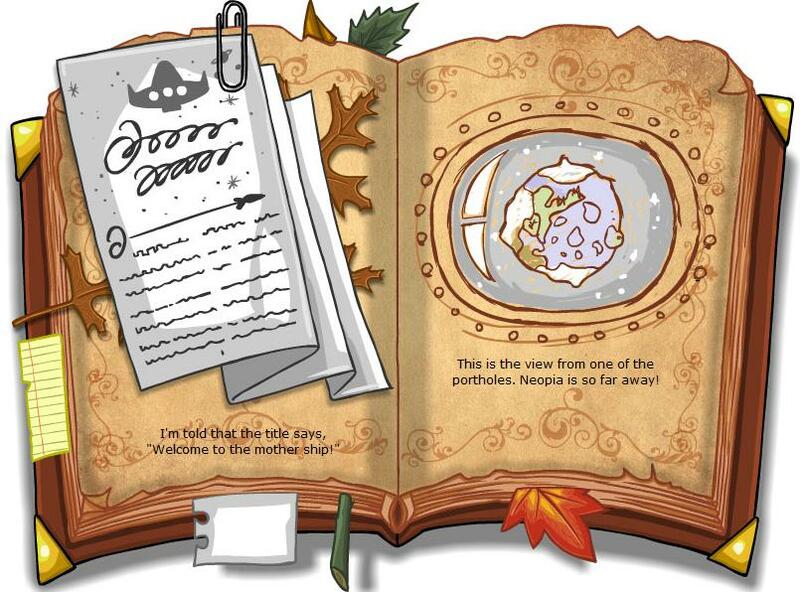 The Alien Aishas questioned King Roo and then released him at the Neolodge back in Neopia Central. I heard part of King Roo's interrogation: "Bugs! The horror! The Games Room was going to be my triumph, the tourist attraction that put Roo Island on the map, and now look at it -- it's ruined! It's... BUGGY!!" Poor King Roo. On that note, I guess I'm off to the Neolodge. See if King Roo checked into the Neolodge. The concierge didn't want to give out that kind of information at first, but he opened up when I gave him a token for the Qasalan Expellibox. Apparently, this little baby Kacheek made friends with King Roo in the lobby. To cheer him up, she told him Donny the Repair Bori could fix the Games Room. She has a plushie that Donny repaired for her, and of COURSE the Games Room won't be any more complicated to fix. Then she insisted on sharing her spa coupons with King Roo, which he graciously accepted. I'm never that lucky. Order room service and get some sleep. So I guess King Roo went to the spa to recover from his ordeal with the Alien Aishas. Good for him. But it sounds like now he's off to Terror Mountain, so I'm heading there myself. Hold on, someone wants to talk to me. Okay, back. Unbelievable! These two Acara girls wanted an autograph and would NOT take no for an answer. I finally had to lock them in a broom closet and sneak off. Sloth's bowtie, can't people see I'm busy? Purchase a hot air balloon ride heading north. I'd like to say that I arrived in Terror Mountain in style, but the truth is that hot air balloons are kind of slow, chilly, and windy. Great views, though. Anyway, I headed straight up to Donny's Toy Repair. Outside the door I found one of the dice from his crown. That was bad enough to make me worry. Stow away on a fishing boat to Terror Mountain. But then, when I knocked, this army of clockwork toys attacked me! I dashed inside, hoping Donny was around to disable his security. Instead, who do I find looting the place? None other than the notorious thief, Valin the Quick! It was Valin who'd unleashed the clockwork toys on me. When he saw me, he locked me up in this broom closet. That fink! It's pretty hard to read what I'm writing here in the dark. How am I going to get out of this so I can find King Roo? Must think. Unlock the door with a convenient hair pin. A fashionable Cybunny is never without her trusty hair pins! It only took half an hour of messing with the lock before I escaped. Valin was still there, filling his treasure bag, so I confronted him and demanded to know where King Roo was. Like any newbie villain, he told me his whole "clever" scheme. Pound on the closet door and yell for help. 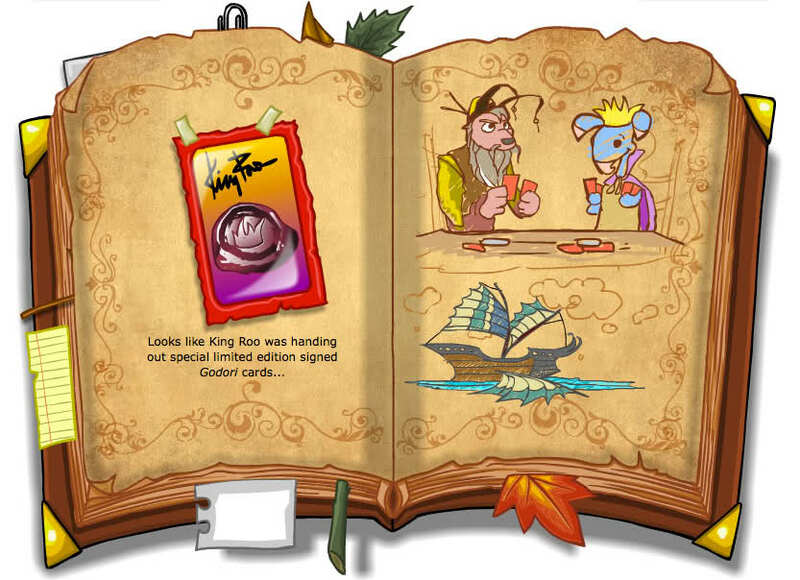 Anyway, Valin was so surprised by King Roo's success that he gave the king a map to find a reputable mechanic. Of course, Valin doesn't have one for ME... so it's back to chasing after King Roo. Make inquiries at the Happy Valley port. Secretly follow Valin to the Thieves Guild. Heh. So the thieves caught me sneaking into their little hideout. Oops. They offered me membership for getting that far, but I turned them down. I'm not that kind of Cybunny, really. Anyway, their spies told me that King Roo had received word from someone in Shenkuu, inviting him to a game. So it sounds like King Roo might visit a mechanic in Shenkuu. Either that, or King Roo forgot what he was doing and wandered off to play games. I hope not! I'd like the Games Room to be fixed, if only so Abigail and I don't have to listen to AAA complain about it. 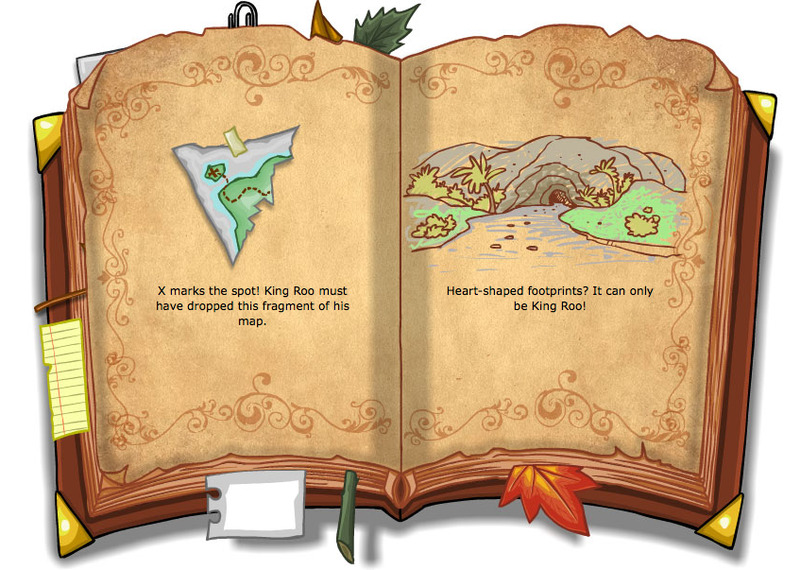 At any rate, since I don't have King Roo's map, I just have to keep following him and hope I can catch up. At least Shenkuu is nice this time of year. See if King Roo is playing in the Kou-Jong tournament. I just spent four hours watching Kou-Jong players match up little tiles. Then Linae walks over and tells me how upset she is that her best player is busy serving tea to the emperor and King Roo and can't play in the Kou-Jong tournament. King Roo was playing Godori today, and I missed him! Stake out the Shenkuu Tangrams fields for King Roo. So it sounds like King Roo was in the Imperial Gardens with the emperor today. I guess when the emperor of Shenkuu invites you to a game, you don't turn him down. By the time I got there, though, King Roo had already sailed west on a courier ship. He must be following the map! Research old maps at the Lunar Temple. Borrow a fishing boat and set sail in pursuit. On the docks, I found this torn off corner of a map, which I'm sure came from King Roo's map, and I saw his ship disappearing out to sea. There was no time to waste, so I sneaked aboard the Lazy Hegelob, a fishing boat, and pursued him through the night. Fishing boats need to come with hot cocoa. Just saying. Anyway, by morning it was pretty clear; King Roo was fast sailing for an island in the middle of nowhere. What kind of mechanic lives in the middle of nowhere? But I finally spotted King Roo's ship moored at a jungle island. I followed his footprints to a cave. I'm no tracker, but these tracks look pretty fresh, which means I missed him by only a few minutes. It looks like the tunnel leads to a long drop into darkness, so I'm finishing up this entry while I can still see to write, and then I'm going in. King Roo is getting away! Leap off into the depths. Make a parachute out of jungle leaves, THEN leap off. Thank goodness I made that parachute, or I might have gone splat. After a long drop through complete darkness, the tunnel opened up into a big cavern. I landed on the roof of Tangor's Workshop, scaring off a flock of Albots. I can't believe it -- King Roo must have followed the tunnel to Moltara City! Guess who found King Roo? Yup, I hopped down off the roof, knocked on the door of Tangor's Workshop, and there he was, having a meeting with Tangor himself. So I suppose there ARE reputable mechanics in the middle of nowhere... at least, UNDER the middle of nowhere. They were pretty surprised to see me. When I explained my purpose in following King Roo, though, he commended my dedication to the Games Room. It turns out that King Roo was on a secret mission to save the new Games Room from the bugs before Roo Island was ruined. Me too, King Roo. 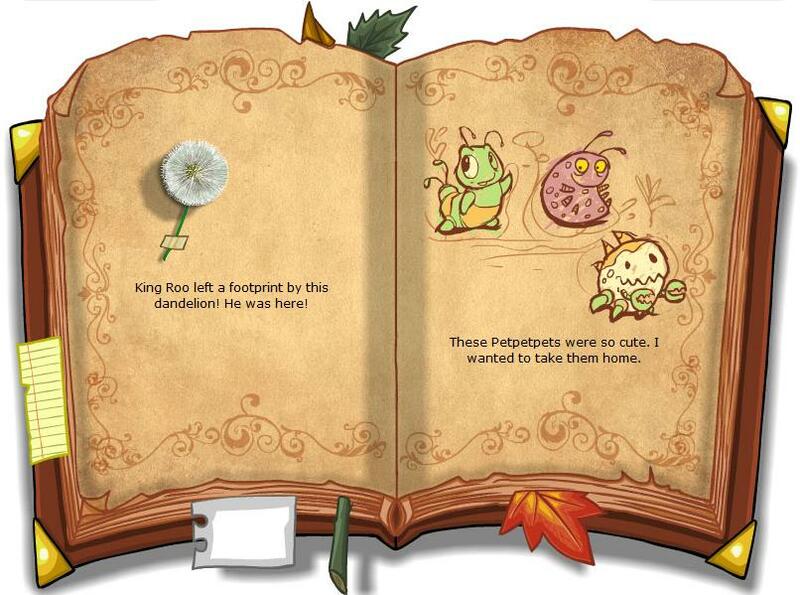 Tell King Roo about the bugs taking over Roo Island. Let Abigail know King Roo (and a fix!) has been found. 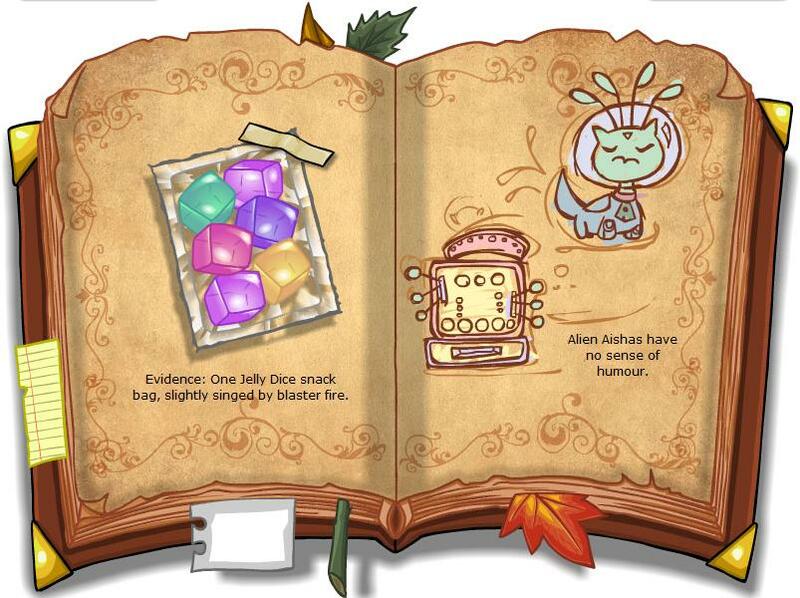 The following bonus item was given out for activating an Adventure Book Page Pack. Now that King Roo has been found, Lulu is serious about getting rid of all these bugs taking over Roo Island. Join Lulu as she continues her NC Mall adventure to help eliminate the bug infestation unleashed upon Neopia, by AAA, after he restarted King Roo's prototype Games Room machine, to continue with the Daily Dare. Lulu will be catching bugs from March 22 through March 26, using special bug-catching nets. Lulu's Bug Nets are available from the NC Mall in 5-packs only. One net pack costs 500 NC and is enough to complete the entire event. You cannot buy nets individually for this event. The nets must be activated in your inventory before you can claim the daily prizes for this event. Prizes do not need to be claimed each day, but they must all be claimed by March 26. There is no bonus prize for activating the Bug Nets or participating in the event. The Snowager is awake. He'll be sleeping in 4 hours, 31 minutes.